This interesting name is derived either from the Olde English pre 7th Century personal compound name "Aedelric". or the later town of Aldridge in Staffordshire, or Aldridge Grove in Buckingham, or from some 'lost' medieval village known to have existed near Worcester. The original personal name was composed of the elements 'adel' meaning noble and 'ric'- a ruler (noble ruler), and it is hardly surprising that in ancient times it was one of the most popular given names. This affection was transferred into the later 12th century surnames, although how many originate from the name and how many from former residence at one of the places so-called is not very unclear. The place names do derive from the Old English 'ale-wic', translating as 'the farm (wic) amongst the alder trees', and the Staffordshire town, then a single farm, is also recorded inthe Domesday Book. 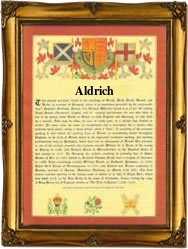 It is not clear as to precisely how many surnames have been created from the various sources, but they certainly include Aldrich, Aldrick, Aldridge, Alldridge, Allderidge, Elderidge, Eldridge, Elrick, Oldridge, and the dialectally transposed 'Arlidge'. The name, as a given name is recorded in the Domesday Book of 1086 in the spellings of Ailred, Aldret and Eldred, whilst early examples of the surname include Richardus Alurici, in the charters of Warwickshire in the year 1209, Robert Alrych in the former county of Huntingdonshire in 1279, and William Eldrich in Surrey in 1336. Drogo de Alrewic in the 1202 Pipe Rolls of Stafford, most certainly originated from the town. The first recorded spelling of the family name is shown to be that of Hugo Aelrici, which was dated 1095, in the rolls of the abbey of Bury St Edmunds, Suffolk, during the reign of King William 11, known as 'Rufus', reigned 1087 - 1100. Surnames became necessary when governments introduced personal taxation. In England this was known as Poll Tax. Throughout the centuries, surnames in every country have continued to "develop" often leading to astonishing variants of the original spelling.